Princess Nails’ new Hologram Top Coat gives clients the 3-D nail art look with little effort. 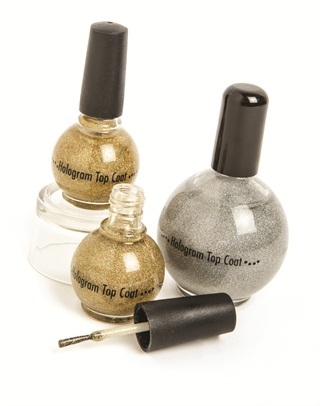 Simply add a coat of Hologram Top Coat in either gold or silver to your clients’ nails, giving them a holographic design. This high-definition polish top coat leaves a gorgeous finish that glitters brilliantly with a shimmering, lighted effect. For more information, visit Princess Nails.